More than 285 were killed and scores injured when a suicide bomber detonated explosives Friday from inside the congregation of the Al Rawdah mosque at Bir Abed in northern Sinai, 40km west of El Arish. This mosque is frequented by Egyptian security officers posted in the region and their families. When worshippers, some of them injured, poured out of the mosque, they came under fire from ISIS gunmen riding off-road vehicles, who were waiting outside to shoot people trying to escape. The terrorists then turned their guns on the 50 or more ambulances evacuating the many injured and disappeared in the desert as Egyptian security vehicles arrived on the scene. Egyptian president Abdel-Fatteh El-Sisi called an urgent conference of security officials and announced three days of national mourning. 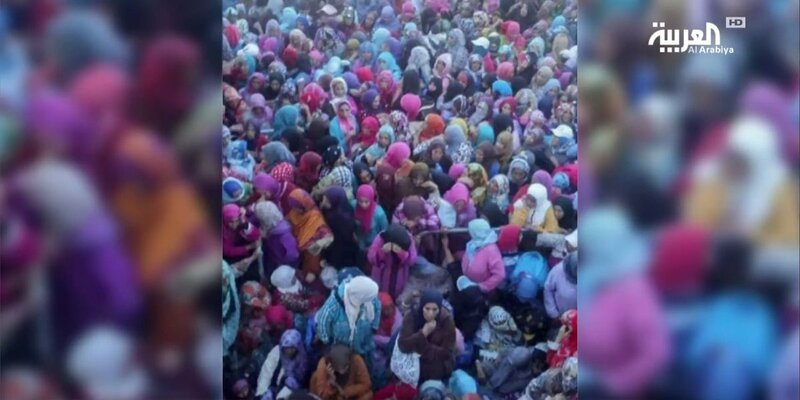 In three years of battling relentless terrorist attacks by the Islamic State’s Sinai branch, the Al Rawdah mosque outrage is the most deadly Egypt has ever known. The site is esteemed as the birthplace of the cleric Sheikh Eid al-Jariri, who is considered the founder of the mystical Islamic branch of Sufism in the Sinai Peninsula. This form of Islam is considered heretical by some conservatives and extremists like the Islamic State group. The Tel Arish road to Rafah, the crossing point from Sinai into the Gaza Strip, was closed. For President Trump's information: Your friend the general misled you. "As of now [March 2016], Syrian Su-24 and MiG-23’s are able to execute precision bombing missions by day or by night, at altitudes which are out of range of portable ground-air missiles. ... and therefore, for more than a year, the Syrian Arab Army has no further need of barrels of explosives dropped from helicopters, which in any case would have been destroyed by MANPADs." My friend said to me that, he said you know it’s interesting, he said you hit them [referring to Trump's order of U.S. airstrikes on a Syrian airbase] because of the gases but the barrel bombs are worse. He said what they do to people is unbelievable. You have arms and legs laying two hundred yards away." Until the arrival of the Russian contingent, the Syrian planes were not equipped with high-precision guided weapons which could assure support for ground troops. They used mainly 57 mm calibre rockets and FAB-50 and FAB-100 bombs, launched in a dive at 1,500 to 3,000 metres. At that height, Syrian planes were vulnerable to fire from Islamist artillery, either 23 mm and 30 mm calibre, and also to portable ground-air missiles (MANPADs), which explains the numerous losses suffered by the Syrian aviation. During this time, 21 Su-24MK bombers from the Syrian Arab Army were updated in Russian aeronautical factory N° 514 ARZ in Rzhev, and re-configured to Su-24M2 standards, equipped with systems integrating navigation and precision weapons-guidance (PNS-M), the same as the Russian aviation from the air base at Hmeymim. In 2015, Russia had supplied the Syrian aviation with state-of-the-art motors and avionics in order to raise 64 MiG-23BN/MLD’s to the standard of their MiG-23-98’s. These MiG-23’s have OLS-M LANTIRN-class equipment for night navigation, infra-red detection of terrestrial targets and the guidance systems for several types of smart weapons, such as those used by Russian bombers deployed in Syria. As of now, Syrian Su-24 and MiG-23’s are able to execute precision bombing missions by day or by night, at altitudes which are out of range of portable ground-air missiles. In particular, they used penetration bombs to destroy the underground headquarters that the jihadists had built in many different areas, and also to hit ground troops, and therefore, for more than a year, the Syrian Arab Army has no further need of barrels of explosives dropped from helicopters, which in any case would have been destroyed by MANPADs. As to the general's mention that barrel bombs cause limbs to be severed and scattered -- my understanding is that this occurs even with victims of suicide bombs that are packed with shrapnel, and with victims of the 'Hell' and 'Hellfire' improvised cannons used by opposition forces in Syria. Those are also packed with shrapnel, and are wildly inaccurate; they've killed many civilians. So if the general was hearing accounts of scattered limbs since the Syrian Air Force had stopped using barrel bombs, perhaps his informants had confused the cannon fire with bombs dropped from helicopters. Or perhaps his informants didn't know what they were talking about, or were lying. No matter whether they're calling pipe bombs or barrel bombs, they are accurate when dropped from a low altitude, but the introduction of MANPADs forced the Syrian Air Force on many occasions to drop them from a higher altitude, thus sacrificing accuracy. Now just how and when did the 'Syrian rebels' get hold of MANPADs? As early as July 2012 there were mainstream news reports that the 'Free Syrian Army' had acquired MANPADs, which might have precipitated or accelerated Russian contributions to the Syrian Air Force. From a Reuters report dated 31 July 2012, it was unclear at the time which government supplied the MANPADs; to my knowledge it remains unclear. The “handover” (remise) of a dauphine was a ritual not unlike a real-estate closing, with a final inspection attended by representatives for each party to the sale. The initial report, however, had flagged some minor flaws that needed correction. So the Parisian dentist who invented braces was imported to straighten the archducal teeth; a dancing master taught Antoinette the distinctive, gliding shuffle of court ladies; and a French coiffeur, M. Larsenneur, artfully dissembled her unfashionably high forehead and the bald spots at her hairline. The rather more glaring bald spots in her culture and education were confided for repair to the worldly Abbé de Vermond, who did what he could with a lazy pupil who had been both spoiled and neglected. Once the makeover was complete, and the frugal Empress had stoically ponied up four hundred thousand livres (the yearly income of a great nobleman) for a trousseau worthy of her new in-laws, the Dauphine and her entourage set off for France. Envoys of Louis XV greeted her at the border, where she entered a pavilion built for the remise on a riverine island that straddled the frontier of the two kingdoms. As a driving rainstorm rattled the flimsy roof, and the future Queen digested the import of a tapestry that depicted Medea slaughtering her children, her Austrian retinue solemnly stripped her before all assembled and bundled up the clothes and possessions, including her pug, named Mops, that were tainted with her foreignness. Weeping and shivering, she became Crown property at the moment that her new ladies redressed her. From The New Yorker, Dressed for Excess: Marie Antoinette, out of the closet by Judith Thurman; September 25, 2006. Thurman makes only a few remarks about Sofia Coppola's film Marie Antoinette (released October 20, 2006 in the USA) and instead deftly recounts anecdotes from the dauphine's life that effortlessly carry the reader through what is actually a very grim tale, one bound to end in a cruel way for Marie. Just how cruel can be understood by viewing Marie Antoinette and the French Revolution, aired on PBS television in 2006. The documentary is almost unbearable to watch when it details the vilification campaign launched against Marie by the more libelous among the French pamphleteers, who made today's purveyors of fake news look like models of integrity. But when all is said and done Marie's life was a parable about the risks of a person becoming the property of a Crown. When the Crown is no more, the property can be disposed of in any way the new masters see fit, as the end of Russia's Emperor Nicholas II also illustrates. Thus, the survival rate for people who became property of the Crown was often measured in their ability to so terrify the Crown's subjects they'd never think of attempting insurrection. Fargeon [Marie's parfumier] had been stirred, in 1789, by the Tennis Court Oath, and its promise of a new order. Though the vitriol aimed at the Queen distressed him, he was more of a republican than his wife, who fainted when she heard drunks in the Rue de Roule singing one of the more vile revolutionary songs. But what was true of the Queen was also true of her alchemist. He recognized the humanity of Marie Antoinette but categorically despised a whole class. I can’t help thinking of Marie Antoinette as a prototype for Emma Bovary, another naïve young beauty who marries a boorish glutton, equally naïve, and lets herself be seduced by a marchand de mode. The Bovarys, too, were a couple with no qualities beyond the ordinary, who were doomed to an extraordinary disgrace, and both stories have a brutal ending in which no justice is served. "With Chabahar, Afghanistan is no longer dependent on Pakistan: Abdullah"
“Afghanistan used to rely only on one transit road, which was through Karachi. That is not the case anymore,” says Afghan Chief Executive Abdullah Abdullah. Afghanistan would no longer depend on Pakistan for transit trade with the opening of the strategic Chabahar Port, a top Afghan leader has said. Chabahar Port, located in the Sistan-Balochistan province on the energy-rich Persian Gulf nation’s [Iran's] southern coast, lies outside the Persian Gulf and is easily accessed from India’s western coast, bypassing Pakistan. The port is likely to ramp up trade between India, Afghanistan and Iran in the wake of Pakistan denying transit access to New Delhi for trade with the two countries. India has been closely working with Afghanistan to create alternate and reliable access routes, bypassing Pakistan. “Afghanistan used to rely only on one transit road, which was through Karachi. That is not the case anymore. [Now] its [also] through Chabahar,” Afghan Chief Executive Abdullah Abdullah said. As per the agreement signed between India and Iran in May last year, India is to equip and operate two berths in Chabahar Port Phase-I with capital investment of $85.21 million and annual revenue expenditure of $22.95 million on a ten-year lease. Afghanistan in the near future would also have trade transit route through Central Asia that would connect the country with Europe. “There are one or two agreements that we will be signing with neighbouring countries, including Uzbekistan, hopefully in a few days which will help transit,” he said in response to a question at the Centre for Strategic and International Studies (CSIS), a top American think-tank. Welcoming the new South Asia policy of U.S. President Donald Trump, Mr. Abdullah said he is today more hopeful than before that Afghanistan will succeed and will overcome the challenges that are ahead of it. He said the aim is that those forces which are fighting against the government of Afghanistan and the people of Afghanistan will be persuaded to come to the negotiating table. Mr. Abdullah argued that it is important for the countries in the region to realise that terrorism is a common enemy for all of them. If there is one lesson in the past two decades, it is that these terrorist groups have not served and will not serve the real interest of any country or state, he said. “At the end of the day they have their own interests which is in destruction and terror and violence,” he added. Mr. Abdullah said the majority of the people of Afghanistan are keen to see a peaceful process. Acknowledging that there are challenges ahead of them, he said there are still groups who believe that they can win through methods of terror and violence. “They receive support and they have sanctuaries. That remains to be a big challenge for us,” Mr. Abdullah said. “But I have no doubt in my mind that there will be conditions and circumstances that more and more groups will be convinced that they need to join the peaceful process rather to continue an endless war,” he said. 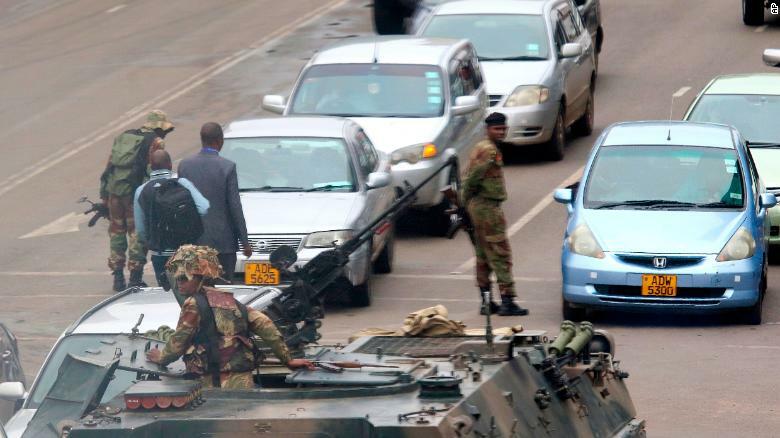 Soldiers in downtown Harare: Just think of us as traffic cops. The tank? 93 year old President Mugabe and wife Grace, aka Gucci Grace for her spending habits: "She's become increasingly more desperate, she knew that once he died she would be kicked out. She had to be installed into some institutional place so that she could seize power." The man President Mugabe sacked, presumably to make way for Mrs Mugabe. As soldiers patrolled the streets, a military spokesman, in a live speech at 4 a.m. local time on state broadcaster ZBC, denied the country was in the grip of a coup, and announced Mugabe and his family were "safe." "What the Zimbabwe Defense Forces is doing is to pacify a degenerating political, social and economic situation in our country, which if not addressed may result in a violent conflict," he said. He urged the public to remain calm but "limit unnecessary movement." In the hours before the announcement, eyewitnesses reported seeing around 100 troops on the streets of downtown Harare. The sudden appearance of soldiers in the capital comes amid rising political tensions in the wake of Mugabe's shock sacking of his deputy, powerful Vice President Emmerson Mnangagwa. The military has been careful not to call their efforts a coup, but that appears to be what is actually unfolding, observers say. "This a coup by any other name," Alex Magaisa, a former political aide to ex-Zimbabwean Prime Minister Morgan Tsvangirai, told CNN. "They might be trying to give a fig leaf to the notion that President Mugabe is still the leader. But de facto they are obviously the military force." A Harare resident, who wished not to be named for security reasons, described the city as "very quiet" Wednesday, though shops were open and buses and taxis appeared to be running normally. "Many people have just stayed home," she said. Police road blocks were in their usual spots and police were "acting normally." The resident added that there was a sense of "excitement in the air" and that social media was humming over what might be happening. Mnangagwa had previously been considered most likely to succeed Mugabe if the president stepped down or died in office. His sudden dismissal cleared the way for 93-year-old Mugabe to appoint his wife, Grace, to the position, prompting widespread discontent among formerly loyalist supporters. Grace Mugabe has drawn the ire of Zimbabweans for appearing to be out of touch. She's been nicknamed "Gucci Grace" for her exorbitant shopping sprees abroad,trips which stand in stark contrast to the lives of those hit hard by the country's massive inflation and debt burdens. Former deputy Mnangagwa enjoys strong support among the country's military and security establishment. A celebrated freedom fighter in the country's liberation wars, the 75-year-old has since gone into hiding and his whereabouts are unknown. In the broadcast, Moyo spoke of targeting "criminals" around the president who are "committing crimes that are causing social and economic suffering in the country in order to bring them to justice." He also said the situation in the country "has moved to another level" and that he wished to assure the nation Mugabe and his family are safe and their security is "guaranteed." "As soon as we accomplish our mission we expect situation to return to normalcy," Moyo said. Chris Mutsvanga, a Mnangagwa ally who heads the influential Zimbabwe War Veterans' Association, and called the move a "bloodless coup" in a statement praising the military. "We salute the patrIotic and gallant forces of the Zimbabwe for once again coming to the decisive rescue of the nation," the statement said. "The populace has long suffered under a self saving dictatorship that had become an oligarch with dynastic delusions." Mutsvanga's group has been historically loyal to Mugabe but it is fiercely critical of Grace Mugabe, who is younger and does not have any connection to the efforts to liberate Zimbabwe. The early morning broadcast interruption came less than 48 hours after the nation's army commander, Constantino Chiwenga, held a press conference in which he threatened to intervene should his political allies continue to be sidelined. State media did not cover the press conference at first, but was re-airing it on ZBC in the early hours of Wednesday, a sign that the military may have taken control of the station. In response to the conference, Mugabe's political party, Zanu-PF, accused Chiwenga of "treasonable conduct." Against a background of increasing uncertainty, the United States, Canada and United Kingdom both issued warnings to their citizens inside Zimbabwe. A US embassy spokesman in Zimbabwe said the embassy would be minimally staffed and closed to the public on Wednesday. The US State Department is encouraging Americans in the country to "shelter in place until further notice" due to reports of violence and ongoing political unrest, while the UK Foreign Office said it is "monitoring the situation closely" and advised people to avoid demonstrations and rallies. The Dutch embassy told its citizens in Zimbabwe to stay indoors. Moyo told members of the Zimbabwe Defense Forces that all leave was canceled and soldiers were expected to return to their barracks immediately and urged the country's other security services to cooperate for "the good of our country." "Let it be clear that we intend to address the human security threats in our country. Therefore, any provocation will be met with an appropriate response," he said. Magaisa, the former political aide, said the treatment of those being detained will be telling of what comes next. 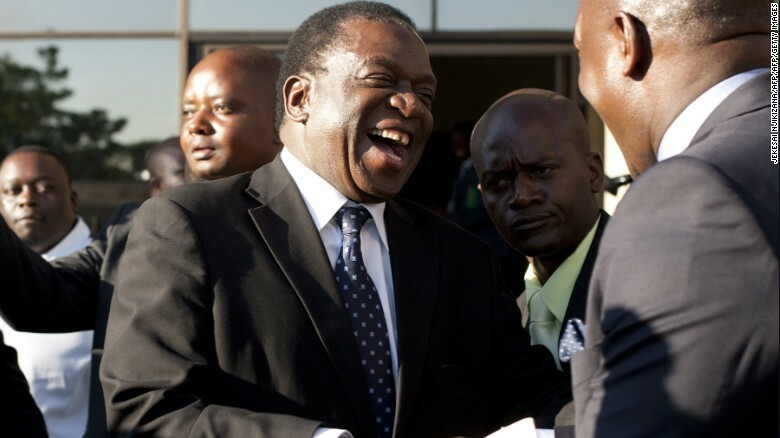 "One hopes that Zimbabwe itself does not descend into martial law," he said. Mugabe, the longest serving leader in Africa, came to power in the 1980s after Zimbabwe's liberation. He was initially revered as a Nelson Mandela-like independence advocate. As that political momentum began to fade, Mugabe moved to quickly consolidate power using a combination of brutality and bribery, according to CNN's Robyn Curnow, who has reported from the region for years. The tactic has been effective. Mugabe, who has held the presidency for more than two decades, remains the only leader many in the country have ever known. "There has never been a coup. There has never been an attempted coup. Any threat to his power base has been by democratic opposition," Curnow said. Many analysts believe that the move by the President to sack his vice president, which gives Grace Mugabe a clearer path to the presidency, was a risky one. 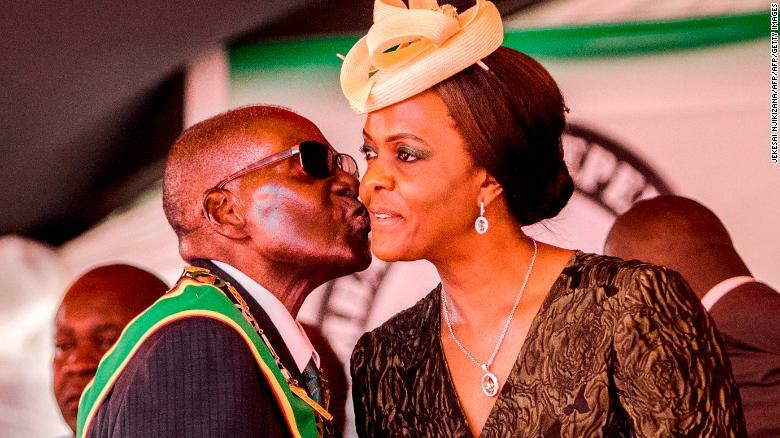 Grace Mugabe is much younger than her husband and does not enjoy popular support, nor does she have the backing of the liberation-era party stalwarts. "She's become increasingly more desperate, she knew that once he died, she would be kicked out. She had to be installed into some institutional place so that she could seize power," Curnow said. While Robert Mugabe and Grace Mugabe haven't responded directly to Chiwenga's remarks, the Zanu-PF Youth League, a key ally of Grace Mugabe, slammed what they said was overreach by the military into political issues. "Defending the revolution and our leader and President is an ideal we live for, and, if need be, is a principle we are prepared to die for," Kudzai Chipanga, Zanu-PF's secretary of youth affairs, told reporters early Tuesday. Report filed by CNN's David McKenzie, Brent Swails and Joshua Berlinger; CNN's Emily Smith, Euan McKirdy and Hilary Clarke contributed to this report. The above headlines are false. From the last headline, the Saudi government announced the reopening of some Yemeni ports and airports. All of these are in the south and under control of Saudi proxy forces who are fighting the Houthi-Saleh alliance in northwest Yemen. Some 70% of the population lives in the northwestern areas, which will continue to be under an extreme blockade. The most important port in their area is Hodeida, which will stay closed. Back in March the U.S. Pentagon tried to get control of the port. But fighting for it would have destroyed the piers and thereby the supply route for some 20 million people. The most important airport is in Sanaa. The Saudi/U.S./UK alliance blocks even UN flights with medical supplies from using it. Saudi Arabia reacting to UN famine warnings says ports in Yemen it controls will reopen for aid deliveries. Riyadh shut them down last week after a missile attack blamed on Iran-backed Houthi rebels. The Saudis now "request" the UN to send an expert commission to Riyadh to "discuss" procedures for future control of the ports that are not held by its proxies. Such a process will take weeks if not months. The Saudis will, like the Pentagon earlier, demand total control over the ports which their opponents will of course not give. Any such fighting will only worsen the situation. To starve Yemeni civilians is an overt act by Riyadh, enraged by a humiliating failure to achieve a Saudi military victory. The United Nations' humanitarian aid official in Yemen has said that the civilian death toll in the nearly two-year conflict has reached 10,000, with 40,000 others wounded. The announcement marks the first time a UN official has confirmed such a high death toll in Yemen. There's much more to b's report. Pundita readers have pretty strong stomachs, I think, so I'm hoping they'll read the rest of what he has to say. But even b, who has a very strong stomach, was grossed out by the news media's complicity, which is by no means limited to the 'western' media. Russian propagandists. American propagandists. Gentlemen. Ladies. Transvestites: You people need to stop fooling around so much with the truth because you're driving yourselves and everyone else crazy. More than 142 of the victims were in Sarpol-e Zahab county in Kermanshah, about 15 km (10 miles) from the Iraq border. The main hospital of the capital of the county was severely damaged and could not treat hundreds of injured people who were taken there, the head of the Iranian emergency services, Pirhossein Koulivand said. A hospital on the Iraqi side of the border in the affected region was also severely damaged. See the Reuters report for details. TEHRAN, Iran -- A powerful earthquake shook the Iran-Iraq border late Sunday, killing at least 207 people and injuring at least 1,686 in the mountainous region of Iran alone, Iranian state media said. The Baghdad government didn't immediately give word on damage or casualties in that country. But Iranian state TV said Iraqi officials reported at least seven people dead inside Iraq, along with more than 50 people injured in Sulaymaniyah province and about 150 in the town of Khanaquin. The magnitude 7.3 quake was centered 19 miles outside the eastern Iraqi city of Halabja, according to the most recent measurements from the U.S. Geological Survey. It struck at a depth of 14.4 miles, a shallow depth that can result in broad damage. Magnitude 7 earthquakes in general are capable of widespread, heavy damage. The quake was felt as far west as the Mediterranean coast. Its worst damage appeared to be in Iran's western Kermanshah province, which sits in the Zagros Mountains that divide Iran and Iraq. Residents in the rural area rely mainly on farming to make a living. The shaker was also felt in parts of Turkey and Israel, the Reuters news agency reports. Electricity was cut off in several Iranian and Iraqi cities, Reuters says, adding that Iran's military was called on to help rescue efforts. Iranian social media and news agencies showed images and videos of people fleeing their homes into the night. Some 50 aftershocks followed. Iran's state-run IRNA news agency said rescue work was continuing overnight and would accelerate during the daytime. "The night has made it difficult for helicopters to fly to the affected areas and some roads are also cut off... we are worried about remote villages," Reuters quotes Iranian Interior Minister Abdolreza Rahmani Fazli as saying in an interview on state television. Officials expected the casualty toll to rise when search and rescue teams reached remote areas of Iran, Reuters noted. Iranian Supreme Leader Ayatollah Ali Khamenei offered his condolences on Monday morning and urged rescuers and all government agencies to do all they could to help those affected, state media reported. Officials announced that schools in Kermanshah and Ilam provinces would be closed Monday because of the temblor. More than 200 people are dead and 1,700 injured after a powerful 7.3 magnitude earthquake struck the border region between Iran and Iraq. Iran's Press TV says the highest number of casualties in the country occurred in the town of Sarpol-e Zahab, Kermanshah province. Iran's semi-official Mehr news agency said 100 of the 207 reported dead were from that town alone. 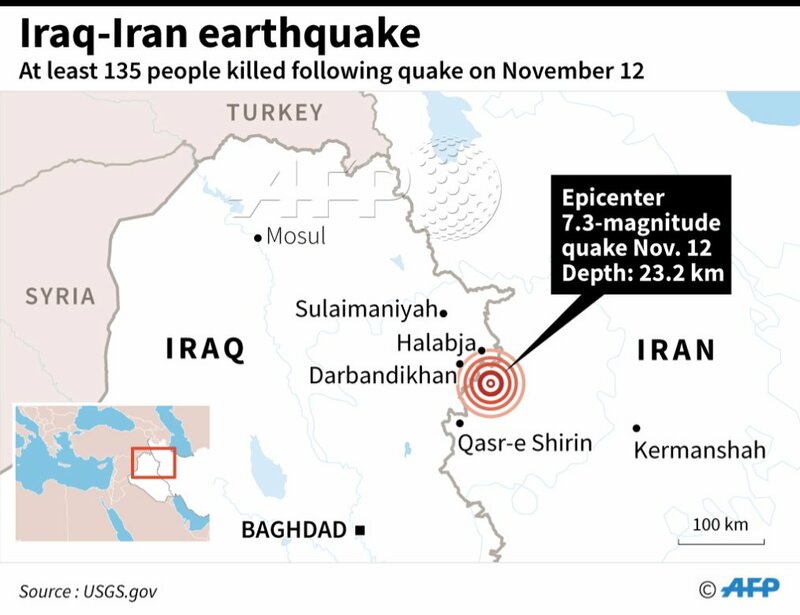 While most of the deaths have been reported in Iran, the quake's epicenter was across the border in Iraq, about 350 kilometers (217 miles) north of Baghdad. The quake crushed buildings in Darbandikhan, in northern Iraq, according to video from AFP. Dozens of people from the town were injured, according to Omar Ahmad, the governor of Sulaimaniya province. In nearby Halabja, at least four people were reported dead. Iraq's Prime Minister Haider al-Abadi was closely following the situation of the country's citizens, a statement from his office said. Report filed by Darran Simon. CNN's Kay Guerrero, Mohammed Tawfeeq, Flora Charner, Hande Atay Alam, Alaa Elassar and Jonny Hallam contributed this report from Atlanta. Shirzad Bozorgmehr contributed from Tehran, Iran and Mohammad Jambaz from Erbil, Iraq.